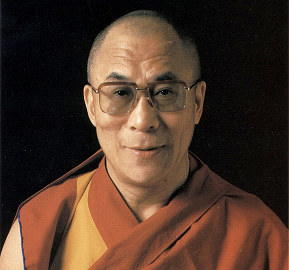 In May of 2001 I was fortunate enough to attend a teaching on the Heart of Wisdom with His Holiness the Dalai Lama in California. At the conclusion of these sessions we had the option of taking the Medicine Buddha empowerment, of which I gratefully partook. "The best way to cure disease is by your own mind - in other words, through meditation. Not only is this the most effective method, but also there are no negative side effects, and as well as healing, this practice promotes peace, calm and tranquility in your heart. Then the happiness you experience is transmitted to others, and thus you benefit as well. One of the best healing meditations is that on the Medicine Buddha, who is the manifestation of the healing energy of all enlightened beings." 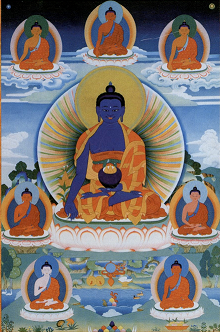 "The Medicine Buddha encompasses all the buddhas. To recite the Medicine Buddha mantra brings inconceivable merit. Manjushri requested the eight tathagatas (Guru Shakyamuni Buddha and the seven Medicine Buddhas) to reveal a special mantra that would make the prayers they (the eight tathagatas) made in the past (prayers to be able to actualize the happiness of sentient beings by attaining the path to enlightenment and pacifying various problems, to be able to see all the buddhas, and for all wishes to be quickly realized) to quickly come to pass, especially for those sentient beings born in the time of the five degenerations who have small merit and who are possessed and overwhelmed by various diseases and spirit harms. During that time, all the eight tathagatas, in one voice taught the Medicine Buddha mantra."